Have you got your hanky? How many times have you heard that? My mother said it to my sister and me, and I'm sure your Mother said it to you, too. I know I said it daily to my five children each morning as they went off to school and I think my long-suffering husband came in for it, too! As I looked through my hanky treasure box, I began to wonder about the history of the handkerchief. Back in the dim, dark ages, we studied Shakespeare's 'Othello, the Moor of Venice' and perhaps you did, too. The first gift Othello gave Desdemona was a handkerchief, and much of the play centres on that gift, and ends with murder and suicide! 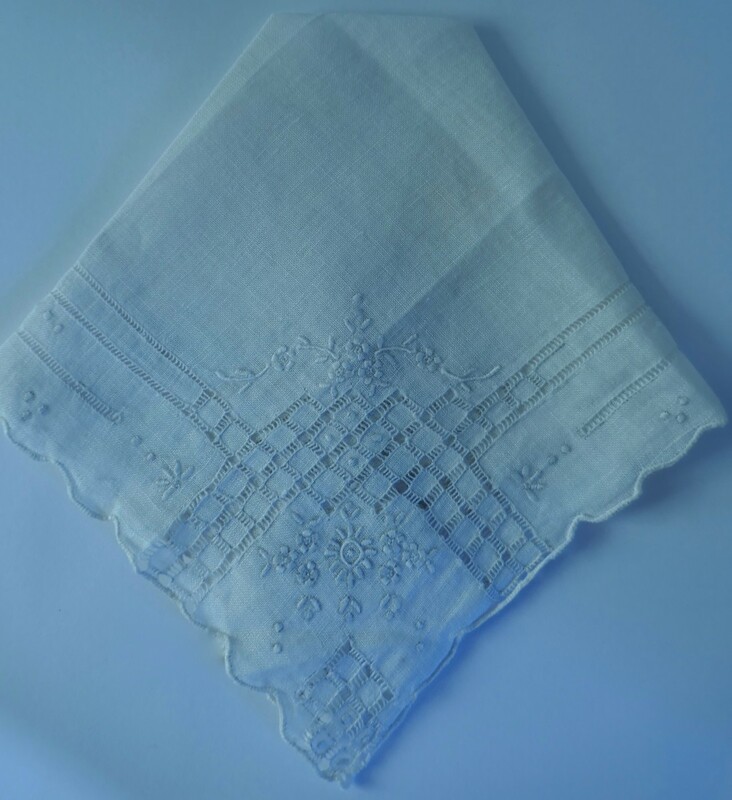 Way back in Greek and Roman times handkerchiefs were used, but they did not become popular in Europe until the Middle Ages. William Shakespeare was born in 1564, and that's quite a while back, but it's around that time that the handkerchief became a fashion statement in Europe. The first person recorded at that time to have used a cloth for wiping his nose was Richard II, whose life was also dramatised by Shakespeare in 'The Life and Death of King Richard II' and he lived in the 1300s! In Europe, the handkerchief mostly began as a kerchief, for covering the head, so it was close at hand when something was needed for many purposes. We still use it as a kerchief, but also—shall I say it? For dusting off our shoes, for tying up small things, so we won't lose them, to dab a wound, to bandage a sore finger.. the list goes on. 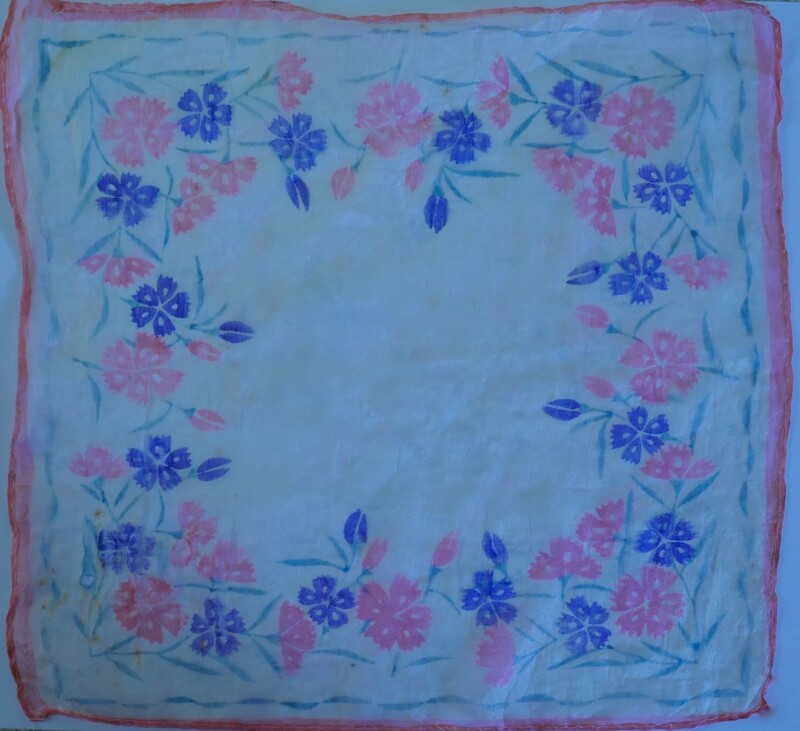 Fabrics Used: Probably long ago, most handkerchiefs were made of squares of linen, but then other materials were used, including silk and cotton. 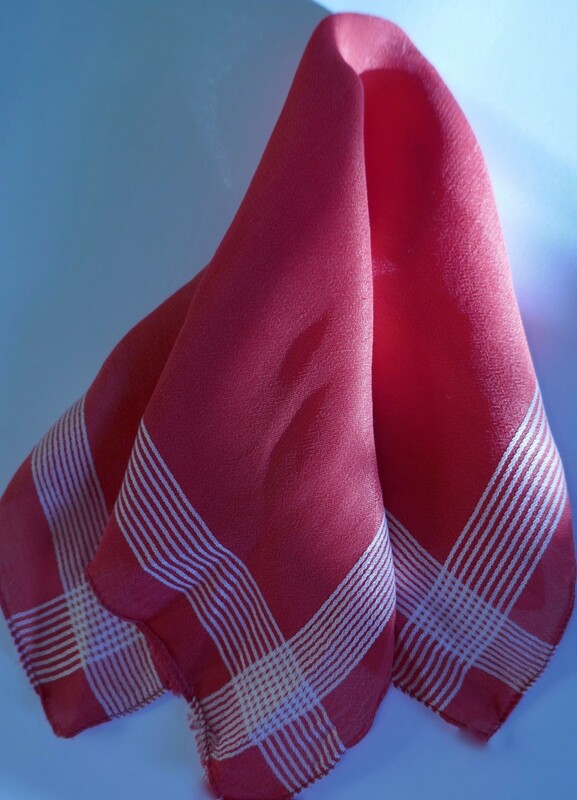 Handkerchiefs are Healthy: When soaked in salty water or disinfectant after use, and ironed with a hot iron, handkerchiefs do not spread germs around. Handkerchiefs are Environmentally Friendly: They can be used again and again and are not left lying around in bins or on the floor as litter, as often occurs with tissues. The Handkerchief as a Fashion Statement: There are several ways to fold a handkerchief, and it's quite an art, especially when used in the top pocket of a man's suit. I have a collection of hankies that have quite a history in my life. I have a dim remembrance of the Great Depression, and my mother making and hand-hemming 'everyday' hankies from worn pillow-slips and old sheets, but the first in my collection is the tiny silk one pictured above. When I was about three years old I began in the Kindergarten of a private school, and I remember that it was given to me to keep in my pocket at my first 'Speech Night and Prize Giving' at the end of the year. For some reason I also connect it with a little silk Union Jack I was given to wave on the exciting occasion of the Coronation of King George VI on 11 December 1936. The next hanky in my treasure box was from the war-time. We had moved from the Bayside into Melbourne (Australia) to save petrol. One month our school held a competition for the biggest potato. All the potatoes were to go to the local Hospital to help feed the patients. I can't remember how big my spud was, but it didn't come out of Dad's vegetable garden that supplied much of our needs, but from the local green-grocer and weighed quite a bit. 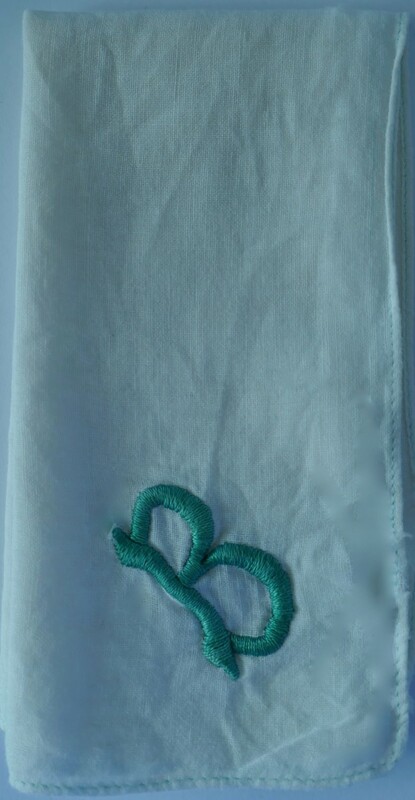 My prize was two handkerchiefs, a green and a blue, with my initials on them. I was so proud of those hankies from the taties! I only have one left now, and much of it is in tatters. Dad was not much of a gift-giver, he usually left that to Mother, but the year I turned fourteen he gave me a handkerchief and a pair of stockings. Both were special, as we usually wore either woollen stockings in the winter or lisle in the summer. It was a real grown-up gift as well as a big surprise. In my late teens, when I had graduated from school I was in College. It was great fun learning to be a teacher with new friends. Where we had worn ties with our school uniform, it became the fashion to pin a bright handkerchief on our shirts. This seems to be the only one that has survived. I think it was made of one of the early man-made fabrics, rayon. This handkerchief was chosen by my mother for me to carry at my wedding. I almost needed it, too! It wasn't the bride who was late, as our home was next-door but one to the church, but my fiancé, who was supposed to drop off the bouquets without seeing me, did not turn up when expected. I was becoming more nervous by the minute and it's lucky that handkerchief isn't in shreds. I was sure he had changed his mind. Eventually he arrived - half an hour late! Our Best Man had only been married for two weeks and his wife had overslept. 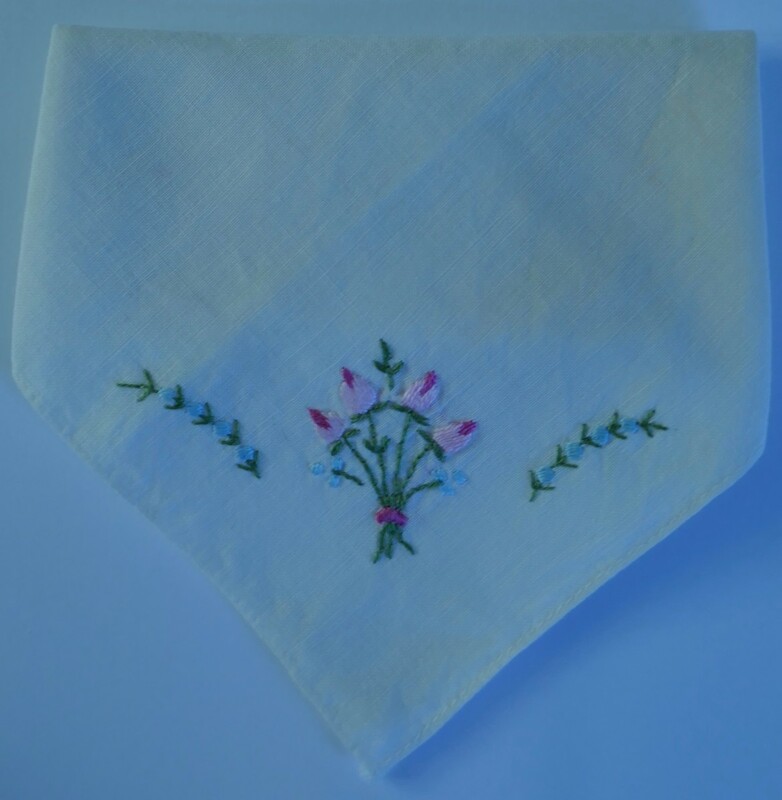 This hanky was my Grandmother's, and could well have been my Great-Grandmother's; she died in 1922 in Kalgoorlie, Western Australia. When my Grandmother died in June, 1948, it became my Mother's, and when she died in 1982, it became mine. There's an interesting story attached to this handkerchief. Some years ago I was told it was at least 130 years old - and that was about 18 years ago! My husband and I had retired and he was invited to speak at a church in Woodend (Victoria, Australia). Later, a lady who lived next to the church came to speak to him. She had seen his name and wanted to return a handkerchief. Her family had lived near my husband's family in Elsternwick and when her daughter, I think her name was Vera, was to be married, my Mother-in-law wanted to give her something, but had come from England, intending to return, and did not have much. The only thing the bride needed was 'Something Borrowed', so the offer worked well. 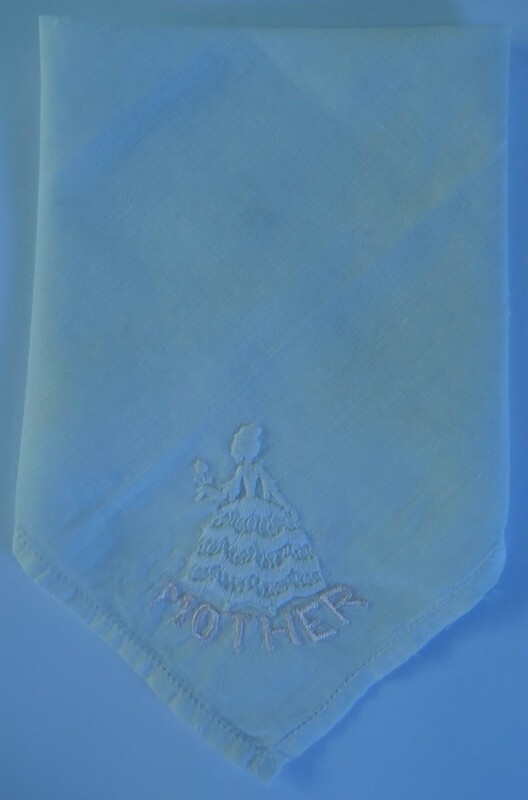 My Mother-in-law's treasured handkerchief was carried for the wedding, but not returned until many years later. Sadly, she had died, so my husband kept it. Oh, dear, where did I put my hanky? 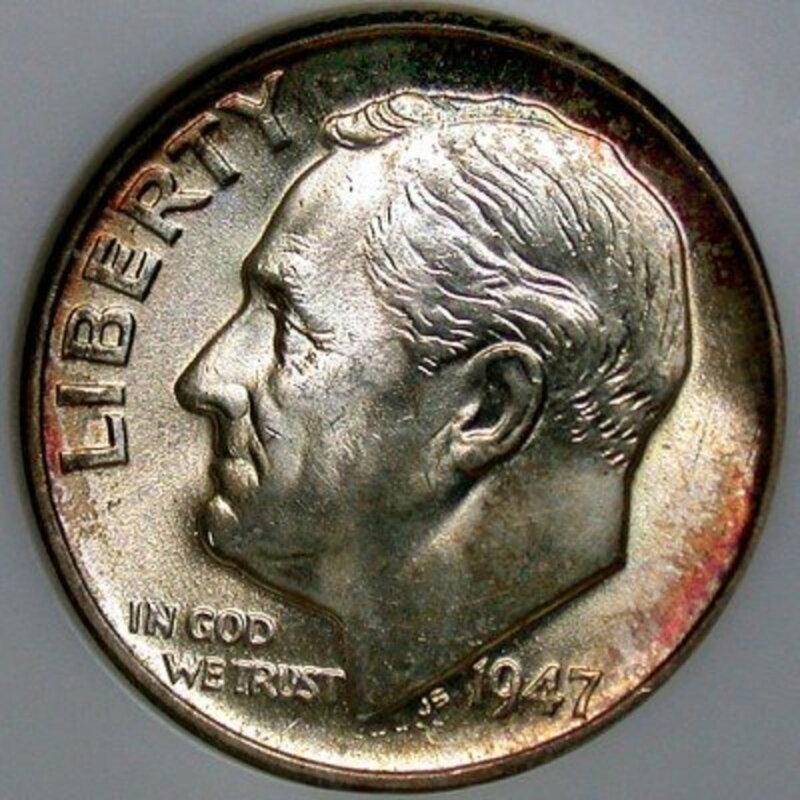 No hanky-panky now, it was in that pocket! Peggy Woods: Thank you. I'm so glad you enjoyed it and, yes, those last three were (and still are) special. What a wonderful collection of handkerchiefs you have and your stories about each of them were fun to read. The embellishments on the last three featured ones are truly beautiful. Julie Macklin: That sounds like a great way to find more hankies to add to your collection. Belgium is famous for its lace, so that one must be very special. Thank you for your interesting comments. I use handkerchiefs. Some I suspect might be (might have been) old, as I often buy them from second-hand shops and I suspect some could be from deceased estates. There used to be such a shop in Berrima and they had the best second-hand hankies I have seen, but sadly the shop is gone now. I would regularly pull in to check out the hankies when in the area. I particularly like those with wide crocheted or lace edges. I often feel a little guilty about using them as that wears them out and the work can be exquisite. But they were made to be used. 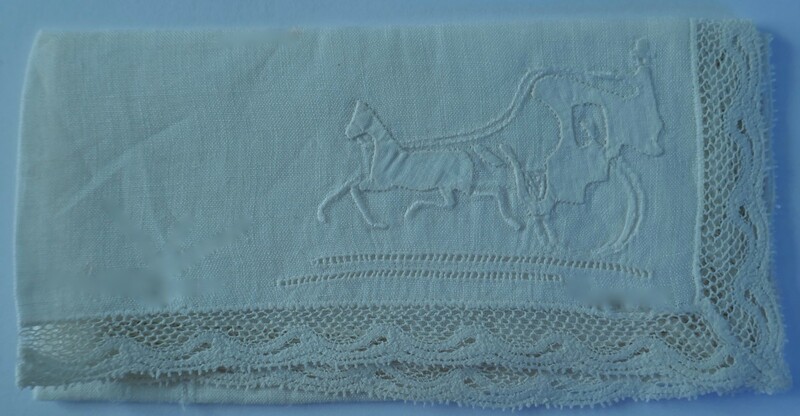 My favourite hankie is one I bought in Belgium many years ago. It has a very wide edge of handmade lace. That one I have never been able to get myself to use. I don't know the history of the second-hand hankies, but I'm sure some would be interesting to know. I like hankies for their look and because they can be reused. Tissues I find a bit revolting. Blown on and discarded; not always thoughtfully. They are messier to use too. Jackie Lynnley: Oooh, frame them! Now that's a great idea! Yes, they are so special, especially that last one on the list, the 'hanky with a history'. I might just frame that one. My mother-in-law was a very special, lovely lady. Hankies were so special weren't they? This is so fun and brings back the memories of something so small. I have a couple for keepsakes. One, my mother's. This makes me want to dig them out and maybe frame them! Marlene Bertrand: I do agree. Besides, tissues are inclined to be dropped all over the place, spreading our germs. Bill Holland: Thank you! They make me smile, too, especially when I think of the memories they evoke from over the years. What a great collection! You made me smile, and it brought back many memories of days gone by when hankies were the norm. Thanks for the trip back in time. Your collection is filled with history. I still carry handkerchiefs in my purse today. But, I buy the cheap linen handkerchiefs - nothing worth any amount of history. There is something about hankies that I like more than paper tissues. Louise Powles: I'm so glad the you share my interest in the history of even the smallest things we have and use every day. Thank you. Gina Welds Hulse: For us females, the bosom is a great place to hide a hanky when some of our garments don't provide pockets. I often find it most frustrating that our clothes often lack such things. I was actually looking at my handkerchief collection recently, and wondering why more people don't use them more. It was all I used when I was growing up. I remember my grandmother always had one in her bosom. Thanks for sharing your collection, and the trip in time. Doris Isaac Weithers: Thank you for your comments, I'm glad you enjoyed reading it. Linda Crampton: Oh, yes! You've reminded me how lovely it was to receive such a gift. It was usually three hankies set out artistically in a rather flat cardboard box. What a pity that some customs just seem to disappear. Fullerman 5000: I remember those sock and hanky drawers. Very useful they were, too. Although we were never allowed to go to Dad's drawers. When his hankies were ironed we had to leave the pile on his side of our parents' bed. Larry Rankin: Thanks, Larry. It is interesting. AMFredenburg: Ha! Actually, I'm not a fan of tissues as I often wonder if they're good for the environment, but they do help to make life easier. William Kovacic: Thank you! I'm so glad that you enjoyed it. I've been very remiss of late, not writing or commenting as much as I used to, but it was a fun topic to write about. Well, I have to admit - that's one topic I never thought of. Very interesting and informative, I enjoyed the pictures as well. Always had to keep one in my lapel pocket, but today, just give me a kleenex, I enjoyed the article much! I remember hankies, and I remember when they got replaced with Kleenex in the fifties, thankfully. My teachers in elementary school used to blow their noses on their hankies and then stuff them back into their bosoms - not a wonderful thought. My Uncle Bob was famous in the family for once uttering the words, "Where's my [g.d.] hankie?!" Fascinating read. I never would've thought such an everyday item would have such an engaging history. I remember growing up, my dad always had a handkerchief in his pocket he would use. Every time we did laundry, a few of them would hang around in the dryer. My dad had a sock drawer and a hanky drawer. Thanks for this history lesson on something so tiny, yet fascinating. This definitely brought back some memories. You've chosen a great topic for an article, Blossom. I have hankies from both of my parents. Some of them are pretty creations. When I was a child, a set of decorative hankies was considered a lovely gift. It's interesting how customs change. Never liked hankies but I admire the pretty ones my aunts and mother used. 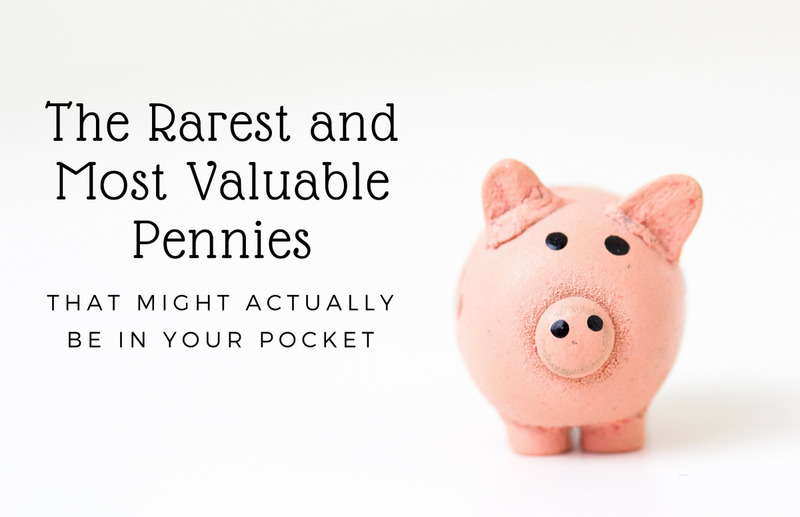 My mother had one or two in every purse, and I'm sure I can still find some. Nice that you have sentiments attached to yours. Enjoyed the read. Thanks for sharing. Eric Dierker: Thank you for your interesting comments. No, not yet, my mother had been a teacher and believed in an early start. I was born in 1931. Don't tell me that you didn't learn to iron, too? I made sure my sons as well as my daughters learned housekeeping skills as well as cooking. And yes, I do still use table napkins, although I call them serviettes! Flourish Anyway: That's lovely! Do write down their stories, so they can be passed on. John Hansen: Good on yer, Mate! Glad you found it interesting; also glad it's not always the same one! Tamajaro: We can get so much pleasure from the small things, can't we! Blessings to you, too. Lori Colbo: Well, it's a practical thing to do. Some of my hankies were mostly lace, with a tiny square of linen in the middle and not in the least bit practical, whereas a man's handkerchief was a very useful size. Love the end of your comment. It's winter here and there are lots of sneezes around. What a lovely, unique topic. I loved seeing your collection of hankies. As I read I thought what an odd thing that a suitor would give his love a handkerchief, basically to blow their nose. I recently returned to using them, so much more mileage than a tissue and can be used over and over. It would not be my thing to use the decorative ones like you shared, but I could admire them. Thank you for sharing your memories and the history of hankies. Achoo! I enjoyed seeing your album of hankies. I must admit I prefer the throw away tissue but I may have to reconsider after discovering it's varied possible uses from your article. I also did not know that the salt water soak could make it somewhat anti-bacterial. I also enjoyed your clever ending. I loved your memories here and recall my great grandmother's hankerchiefs, some of which she gave to me and I still have. I don't erasure the things she has passed down to m as it k EPA her spirit and stories alive. I do declare that I used hanky's but that was as a small lad out in the Hitherlands at 7,000 feet and kind of apart from man kind as was known. But I also am quite sure you mentioned 1936, at your coming to school age. Now would I be wrong in guessing you just shy of 90? And if this be so/sew I would venture that you need to get with it lassie and start telling us far more than about the hanky. On the other better hand. I love the memories of men lending their hankies to ladies in need. Funny thing that. Although the ladies certainly had a hanky a gentlemen seemed to have two. And one was clean and whipped out to a gal who had a feeling that would require one. My mom made sure us boys had two. And I do recall them being ironed by my sisters on ironing day on our big IronRite machine along with napkins for dinner. This made my dad smile in heaven, thank you.